Do you want to make your website faster? Here I have listed 4 Free Websites to Test Web Page Speed. Using this website you can identify how your website is faster. This will help you to identify slow pages and understand strategies to increase Page speed and improve site loading times. It is very important to load your site fast because it is essential now for search engine optimization, as Google algorithms do consider site speed in page search engine rankings. We have tested our site on these tools to show you some screenshots. We commonly use these services to assess our site performance. PageSpeed Insights analyzes the content of a web page, then generates suggestions to make that page faster. This is the official tool By Google. To use Google Pagespeed Insights, simply enter the URL which you want to test, and you will get Page speed scores for both mobile and desktop view of that page. The desktop and mobile speeds are especially useful and a fast desktop site might actually be a very slow mobile site. The page speed suggestions are also linked to resource pages so that you can understand what site modifications can make your pages load faster. So It will suggest page optimization tips that can make the pages load faster. Run a free website speed test from multiple locations around the globe using real browsers (IE and Chrome) and at real consumer connection speeds. 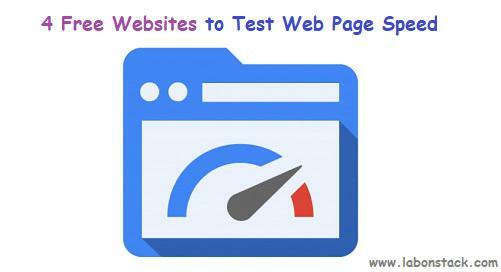 WebPageTest provides an in-depth analysis of your site page load times and can provide detailed graphs and charts. You can run simple tests or perform advanced testing including multi-step transactions, video capture, content blocking and much more. Your results will provide rich diagnostic information including resource loading waterfall charts, Page Speed optimization checks and suggestions for improvements. GTmetrix gives you insight on how well your site loads and provides actionable recommendations on how to optimize it. GTmetrix is a useful tool which provides in-depth analysis of the many speed parameters. It also provides a waterfall view and page load timeline. The tool gives page speed optimization recommendations based on several parameters and how the scores can be improved. Their Report gives you the full picture on how your site loads and helps you detect where bottlenecks are. They built this Website Speed Test to help you analyze your website load speed. Pingdom Website Speed Test quickly analyses your site to give a waterfall view of different page elements. A detailed page analysis also analyses the content size and type and server code responses. The test is designed to help make your site faster by identifying what about a webpage is fast, slow, too big, and so on. They have tried to make it useful both for experts and novices alike. In short, they wanted it to be an easy-to-use tool built to help webmasters and web developers everywhere optimize their website performance.